Harp Therapy is an ancient art. Since 1993 this pioneering discipline has been revived. It is a means through the resonant sound of the harp to provide comfort care. In this work we bring the gift of being fully present to another person. Using the gateway of the harp as a tool, we hope to provide a gentle cradle of sound to help support individuals in times of physical, emotional and spiritual stress. Areas we address are: breathing, anxiety, fear, pain, nausea and depression. Harp therapy is being used in hospital, rehabilitation, Alzheimer, hospice and educational settings to help promote healing. By healing we do not mean curing, but rather bringing Mind/Body/Spirit into a state of oneness. When people receive the music, the opportunity is provided for them to release emotions in the form of tears, or they can relax into slumber. These individuals can then experience a state of deep peace. Harp Therapy is not entertainment or atmosphere music. It is not a bedside concert. In the giving of our full attention and presence to each patient, we assess breathing patterns, looking for signs of tension in the body and on the face. When patients are on blood pressure and heart monitors, we can see the effect of the music on the person's physiology. The presentation of live music is different from listening to a CD or taped music in that live music can be delivered addressing the patient's breathing patterns and can be slowed at will. Also certain musical modes may resonate more than others with a patient, and these can be changed instantly with live music. No two presentations are ever the same. We also provide an opportunity for all those who are interested to create a beautiful sound on the harp. This experience can help to elevate a patient's mood. The music is most effective when it is delivered in silence, especially during the time of transition. We encourage families to talk before we begin to play and after we have finished. This does not mean we forbid talking, but we suggest talking be kept to a minimum and be soft in volume. The music is meant to be supportive for both families as well as patients. We can play favorite hymns and songs for patients when requested if we can locate them. However, the music that is played to help people "let go" and deeply relax will probably be unfamiliar. In working with the creation of sacred space, the music is an anointing and touching for each person present with resonant and polyphonic sound (many tones played together). Music more than any other of the fine arts, combines science with aesthetics. The physics of sound waves affects our minds and bodies at the cellular level. Harp therapy creates serene environments for people in hospitals, cancer centers and oncology units, skilled nursing and assisted living facilities, Alzheimer units, hospices, corporate settings, schools, Tai Chi classes, and worship settings. 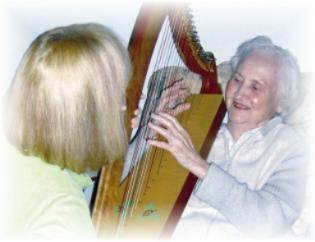 Harp therapy is a healing modality that affects the whole person.